Good revamp much better than the Devonshire. Also I really like the secret garden. Revamped and reopened. The interior is modern but one of the better examples of a refit (as opposed to the nearby Duke of Devonshire - Good God what have they done). Most importantly the selection of beers they had on when I visited was excellent; Landlord (which I believe is always on) with Doom Bar and Butcombe. Friends of mine who had eaten there earlier in the evening said that the food was a little hit and miss but the service was excellent. 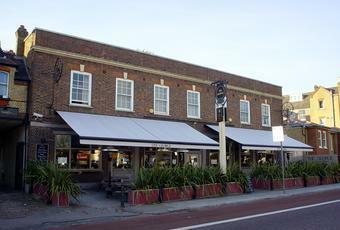 The George has now closed. It is now the Avalon, looks good so far. Not sure how well the restaurant part will do , but the bar is good and nice bar food. Not sure if they're doing it up or not? Looks so lovely outside, but inside its had its soul ripped out, cavernous with horrible leather sofa's! Could do better!! !